By the end of 1964, it became evident that the CCSA, as constituted, had serious limitations. It was a letterhead organization, riding on the credibility provided by the names of our prominent board members; it lacked a substantial membership and roots in the larger Jewish community. All told, we were a handful from Beth Israel with a sprinkling of Eastsiders. We had made a splash both locally and nationally; but, to become an effective force, we needed to recreate ourselves. Then, thanks to a single event, we markedly increased our membership. The event was a community rally, a joint effort by the JCFC and the CCSA. The Federation provided the financing and they and we shared in organizing the program and arranging for speakers. The Federation engaged Heights High School auditorium, a large hall, centrally located in the area of major Jewish population — a great choice. The event, billed as “A Community-wide Rally to Protest Soviet Anti-Semitism,” was held March 7, 1965. The attendance was overwhelming — a crowd of 2,200 plus — more than filling the 2,000-seat auditorium. The overflow was moved into the hallways in the building and portable speakers were quickly put in place. This display of interest was a revelation: concern about Soviet Jews was latent among ordinary American Jews. The program went well. The principal speaker, Rabbi George Lieberman from New York, gave an impressive account of life for Jews in the USSR. Prominent Protestant and Catholic religious leaders provided expressions of concern, and a number of local, county and state political figures offered support. 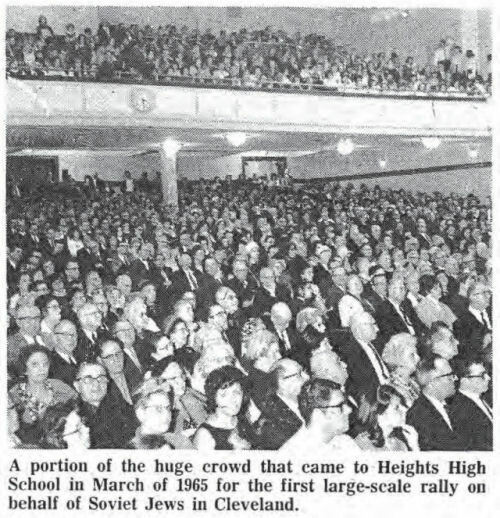 The Rally was a major step forward in the education the Cleveland Jewish community about Soviet Jewry, and a step forward in informing the public about the CCSA. For the CCSA, the immediate outcome was impressive — more than 500 new members! Here again we had an instructive demonstration of the impulse to help a threatened Jewish population.